Cabin A-4 "The Canopy Cabin"
You'll love this stand alone cozy cabin with it's wood canopy king bed. We are updating again! This cabin is one of the BEST VALUES in Branson. 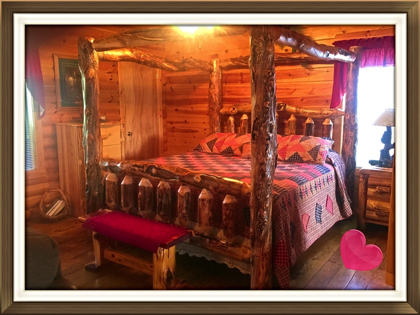 Cozy and quaint, with all the "Old Timey" charm of an Ozark Mountain cabin, it makes a tremendous get-a-way for your honeymoon, anniversary, or a special retreat. 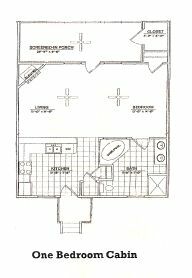 You will love the canopy bed, huge corner jacuzzi; the private setting, and the shared memories of your personal celebration. This upscale log cabin is lovely, and is located in an awesome resort. Only one mile to the strip, you still have the absolute feel of being in the country. The resort includes all the amenities you would expect. So for the time of your life come and enjoy ALL that Branson has to offer! Visit us once and "You'll be Back." Nearby theaters, entertainment, attractions, restaurants, shopping, golf, Branson Landing and historic downtown. "The Live Entertainment Capital of the World" offering a wholesome variety of shows and entertainment that your whole family will enjoy, as well as spectacular lakes, championship golf courses, theme parks, outlet malls and eclectic restaurants make Branson a remarkable vacation destination for visitors of all ages! Mountain View, Porch has Swing, Table & Chairs and TV, Off Street Parking, Business Center, Clubhouse, Concierge Service, Pavilion, Nine hole putt putt course, Horse Shoes, Lighted Playground, Sand Volleyball, Fire Pit, Walking & Biking Trails.